This shifting of the provider into the “passenger seat” has fundamentally altered the way companies are looking at their customers. They have moved away from considering them as mere consumers and have instead, begun to understand that they have to consider them as subscribers. Today, everything from socks to software is available as a service. Everyone wants on the subscription bandwagon. It’s no longer the Age of the Customer. We have entered the next wave, the Age of the Subscriber and the defining theme of the new age is renewal. Today’s successful companies have figured out that if their customers aren’t engaged, adopting and successful, they are not going to have them for long. Service and satisfaction are now just as important as features and cost when it comes to differentiating an offering during the sales process. It means that Customer Success has gone mainstream. The shift towards everything as a service has become the ultimate game changer, and Success is a key player. Welcome to the Success Economy. It’s simple. If you are in the subscription business, and the renewal is king, then you are in the Success business. While acquiring new subscribers is undeniably a critical activity when growing. Most large companies are only generating 15% to 25% of their revenues from new customers. A huge percentage of their future recurring revenue, as much as 80%, is going to come from just 20% of their current subscribers according to studies done by Gartner Group. Healthy relationships are what make a subscription model work. Without them, there is no way you’re going to have a sustainable recurring revenue stream, and your growth is going to be severely stunted. Drucker tells us that the entire purpose of business is to satisfy its customers…That satisfying customers is why every business exists. I would take that line of reasoning one step further and assert that it’s also how we continue to exist. Every company needs to be customer centered, and success focused or risk becoming a cautionary tale. Customer Success pays the bills. Forget that at your peril. Still not clear why Success is so important? The answer is at the core of the Subscription model. With the explosion of Software as a Service, it’s never been easier for a company to locate a solution and deploy it in record time. What makes the Software as a Service model so attractive to customers is also what makes it such a challenge for business. No lock-in. Leaving is as easy as closing your browser and canceling your subscription. Like a teen with ADD, a companies focus, and strategy can shift rapidly. The relentless pace of the market demands it. As a provider, if you are not inside this cycle delivering value quickly and measurably, you will find your customers switching to another offering without a second thought. So what are smart companies doing? They are setting themselves apart by doing something so simple that it’s almost face-palm worthy. They are making their customers successful according to the customer’s definition of success. Put bluntly, in the subscription-based world, you are only as good as the worst experience your customer has had with you. The barrier to exit amounts to nothing more than a speed bump. The challenge in today’s market isn’t necessarily in finding customers; it’s in keeping them. Make them successful (and keep them that way) and they will stay with you for life. That’s how you turn the Subscription Economy into the Success Economy. Who can Benefit from focusing on Customer Success? As practitioners and companies alike can attest. Success isn’t something just for the established business. Or even limited to software. Success is the new mantra for business, but it’s nothing new. Success has been delivered in various forms and under many names for hundreds of years by the enterprising individuals and companies that understood one simple truth. Happy customers = return customers. What has changed in recent years is that Success has gone through its equivalent of the Industrial Revolution. Converting from something only delivered by “artisans” to something that is delivered to the masses at a reasonable cost. Whether you’re a multinational, a new start-up or a small, brick-and-mortar business. Success is for you. Success is that special something that will help you differentiate and grow your business. Success is the great equalizer. Large or small. Its disciplines and ideals can be applied across a broad range of industries and is not limited by vertical, market or product. While factually accurate, the above definition is more than a mouthful (sorry Lincoln, not picking on you). When this is the first thing someone sees, it’s no wonder that they get confused about Customer Success, what it is, why it’s crucial and how to deliver it. I prefer a more straightforward definition. Success is helping your customers to achieve their definition of success through the use of your product or service. Nothing fancy. It’s essentially the handshake pitch for Customer Success. Put another way. You achieve success by making your customers successful according to their definition of success. Not yours. There has been a lot of mention of the need to create “Customers for Life” to have a healthy customer base. Everybody wants them. The experts tell you that you need to convert your subscribers into them. But how? The formula for making them isn’t like the Colonel’s secret recipe. Customer longevity isn’t a happy accident. But, it isn’t all that complicated either. It only occurs when you make their version of success a reality for them and continue to do so. The concept of repeatability is one of the keys to the Success “castle”. You must be able to achieve success repeatedly if you intend to build a Success Engine to power your growth. Success is not a singular event or a destination. It’s a recurring event. Something that you have to deliver in a repeatable fashion. Anything else and what you’ve created is a “Customer for the Moment”. Here today. Tomorrow who knows. The days of the drive-by sale are long gone. You aren’t going to be “killing it” if you expect to be making the big deal and walking away with the check. In fact, it’ll soon be killing you in the form of “Leaky Bucket Syndrome”. The expectations of the service that you provide and the value that it will deliver can and will make or break you. The reality is that today’s customer expects more from the software as a service solutions that they select. The clue is in the name. It’s that second “s” in SaaS. SERVICE. Today, customers want to feel like the solutions they’ve selected are…you guessed it…invested in their success. That said, they don’t just want the service you are providing, they want your experience as well. They expect you to be able to provide guidance and advice. Your customers expect that you will seek to understand how they intend to use your product, the expected outcome, and that you will then guide them along a path that leads to them realizing these expectations. They expect that you are just as invested in their success as they are. If you can’t help them to achieve the outcome that they expected to, then they are onto the next option. To another solution, that WILL meet their needs. Success is the silent “s” that is missing from far too many SaaS offerings. Remember that a successful customer is a valuable customer. The effects of getting success right are measured in a variety of ways. The two dimensions that are the most telling in general are growth and profitability. Getting Success right puts runs on the board in both areas. Is your Customer Advocacy increasing? Increased Advocacy = lower CAC (and increased CSAT among other things). Create raving fans for the win. Having a large number of advocates in the customer base pays huge dividends when it comes to accelerating new customer acquisition — ask anyone in Sales about the value of a killer reference. When you excel at creating advocates you see the impact surface in a variety of ways but one is a reduced Customer Acquisition Cost (CAC). To be able to connect-the-dots on this, look to build a rock solid Referral/Reference program that ties advocate influenced sales wins back to the reference so that you can accurately gauge the efficacy and impact of each of your advocates. What is your Revenue per Customer? Land and expand, don’t land and stand. You spend a lot to acquire a customer, typically not generating any positive cash flow from them for a year of more. Want to get out of the negative cash flow hole quicker? Successful customers buy more. Nail your onboarding and ongoing Success efforts, deliver value quickly to accelerate your growth in MRR via expansion, cross-sell and upsells. Focus on creating rapid initial success and then leverage that to expand your footprint. High growth rates always help with increasing valuation. Do you have a high rate of Retention? Churn = Missed Expectations. One word scares the sh!t out of most SaaS leaders: CHURN. There is nothing that can slow your growth as a company faster than that one little word. If you rock at acquisition but fail to avoid “Leaky Bucket Syndrome” you can expect to see your growth curve flat-line (along with your valuation). Conversely, reaching the Negative Churn “promised land” pays huge dividends and can skyrocket your growth. I recommend focusing on churn early on as it is an area that you can exercise control over. Most often the early sources of churn are related to missed expectations, either on the product or service front. Diagnose these early on and avoid having them metastasize. One emerging metric that you should also consider looking more closely at is your Cost to Retain a customer. After all, if it costs less to keep them in the boat then, it should also help with your overall Unit Economics. Are you Unit Economics solid? Solid Unit Economics = increased valuation. Improving your Unit Economics can pay huge dividends. One area to focus on is the dynamic relationship between what can be done in your product and what requires you to invest in additional resources. Focus on driving more solutions from the product side if you want to avoid the “it’s easier to throw bodies at it while the technology catches up” trap. Taking the “throwing bodies at it” approach to problem solving is all too common in rapid growth environments. The challenge is eventually the technology does catch up and then you don’t need all of those bodies and in the mean time your operational costs are skyrocketing and your Unit Economics are totally out of whack. Avoid this mess by mapping out your ideal customer lifecycle and bringing in automation early on so that you can deliver Success at scale with solid operational discipline. When you do need to grow, understand what your unit of growth is and be disciplined about adding resources. These key actions will help with getting/keeping Gross Margins where they need to be. Increased customer satisfaction, retention, revenues, and a reduced CAC all have a direct impact on the business and can be seen in accelerated growth and greater valuations. Who doesn’t want to be growing fast and worth more? Everybody loves a unicorn…well, sort of. While we talk a lot about how Success positively impacts a company we cannot ever forget that Success is really about the subscribers and their experience, their journey. With that in mind, I want to dust off an old idea and breathe new life into it as a rallying cry for all the Success-perts that have perhaps lost their way amongst all the sound byte level guidance. Let’s get back to basics. Let’s focus on the customer’s experience, their journey, first. While the destination matters, it’s the experience along the way that defines how the customer feels once they reach the destination. Are you a trusted guide or just the somewhat helpful stranger who tells them “it’s three lefts and then a right” to get where they want to go? 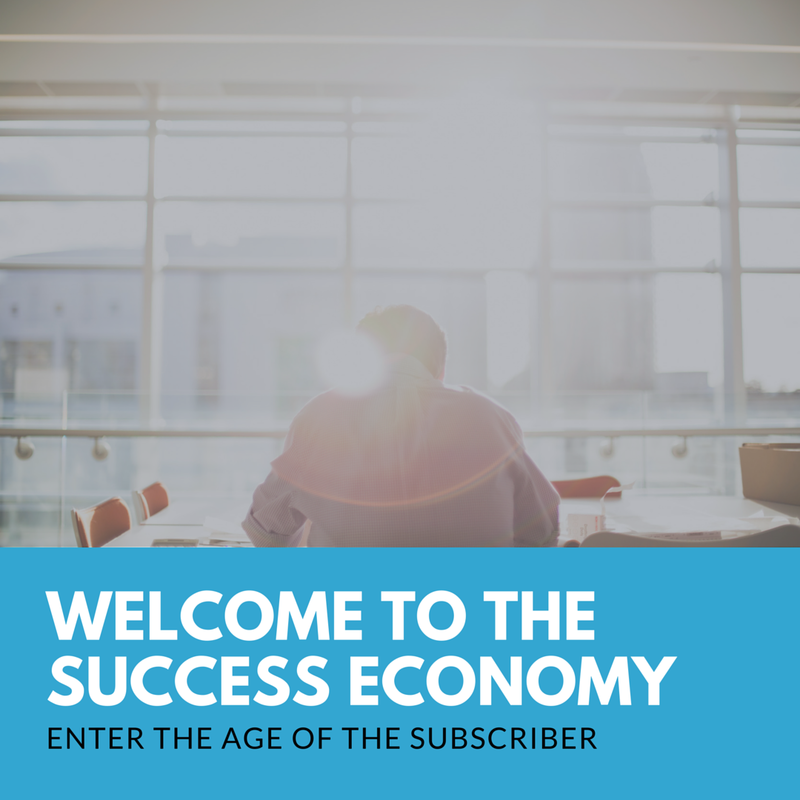 The Success Economy is here to stay. Embrace this fact and thrive. Ignore it and serve as a cautionary tale. Remember it’s about their definition of success. If you make them successful, you will be as well. To move beyond speaking these truths as empty platitudes. I wanted to share with you the credo that I have taken with me on my journey of success. This simple mantra has been my philosophical hub. I created a template for the card on Canva if you’d like to use it, you can grab a copy using the link above. What are your guiding principles for Success? How will you thrive in the Success Economy? Brought to you by the SuccessHack-tivists at SuccessHacker. Your go-to partner for Customer Success. Follow us on Twitter @success_hacker. Want more inspiration, advice or just to connect with thought leaders in the Success community? Join OUTCOMES: The SuccessHacker Customer Success Community. Subscribe to the Customer Success Journal. Read by 1000+ Customer Success professionals around the globe, The CSJ gives you the competitive edge to stay ahead in Success. Insights you need. Guidance you can trust. Each companies journey towards delivering Customer Success is complex, uncertain and individual. We're sharing everything we've learned during ours to help make yours a little easier.